It is that time of year when everyone talks about the “quiet period”, long lunches, early days, parliament isn’t sitting, meetings are coming to an end. It’s December in Canberra. Not everyone is this lucky, I know when I was in government, I wished we got some downtime, but we seemed to always sprint towards the finish line. 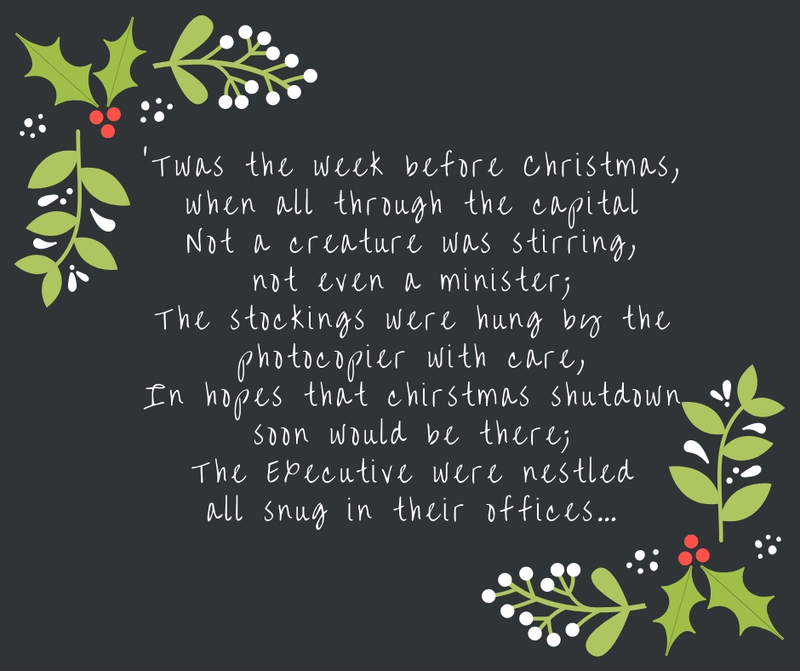 If we were lucky that half-day before Christmas shutdown allowed us time to clean our desks, finish out filing and pretend like we were prepared for the new year. In a recent Facebook poll, 83% of you said you were sprinting towards the finish line rather than enjoying some downtime. Regardless if you are reading this because you are bored and have already read every news website, blog and cricket update or if you are still running hard here are a few things you should try to get through in the next few weeks to set yourself up well for the new year. How to capitalise on the “downtime”– if you get it. Business plan: This is a great time to review your business plan. How have you gone in the first two quarters? Do you need to move some deliverables? What do you need to get a start on first thing in the new year? If you don’t have a business plan now is a great time to pull one together. Nothing like starting a new year with a clear plan of what you are going to be delivering. Budget: Soon after you get back from your break it will be time to do a mid-year budget review. How are you placed? Do you need to think about budget bids or where you can make savings? Any new projects you want to get started? Desktop: How many documents are currently saved on your desktop? Be honest. Time to do some virtual and physical filing. Even if you are still busy, it’s a good habit to get in to, to create a time of the year that you get this tedious life-admin activity done. While you are at it give your desk a good wipe down, get the new year off to a clean start. Say thanks: In the time of good tidings and goodwill to all men, take an opportunity to stop and say thanks. It could be to your team, a colleague or a boss. Send a nice email, take someone out for a coffee, walk up to their desk. Take a moment and thank those people that have helped you out, throughout the year. That stuff you never have time to do: You know what I mean, all those jobs that seem to fall to the bottom of the to do list during the year. It might be because there are more urgent things, or you just didn’t want to do them. The evaluation report, writing an important but not urgent strategy, project planning for something that seems a long way off. Now is the time to do it. Put aside half a day and knock off that to do list so that you can start afresh next year. All that stuff you have put off now is the time to do it. The countdown is on, soon there will be 10 days of sunshine, Christmas presents and over-indulgence. Use these last few weeks wisely to set yourself up well for the year ahead. It can be a cleansing experience wash away 2018, welcome 2019. 22 days to go (to shutdown).